I was a bit of an attention hog when I was younger (yeah, laugh it up- I know you’re thinking, “When you were younger? What about now?”). But it was much more dramatic when I was little (stop laughing- I can hear you). I’m not sure why. I don’t know if it’s a personality flaw or if I truly didn’t feel like I was getting enough attention in my life. 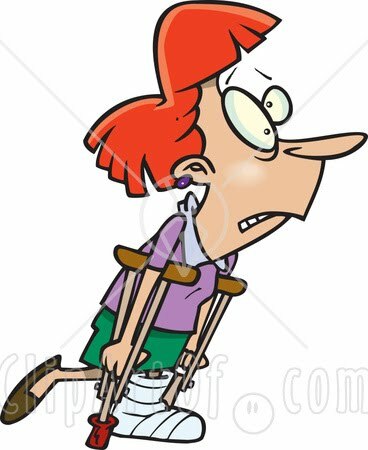 Like, one time I remember convincing somebody in the 4th grade to let me use their crutches all day. How did that kid get around the rest of the day? Idunno. And apparently I didn’t care. But I did use them all day and I let my teachers and kids from other classes ask me what happened. I can’t remember if I made something up or told them I was faking, but I do remember having burns under my arms for a couple of days afterward from the crutches. I didn’t do that again. I also remember when this girl broke her arm at day care. Now, the way I remember it, it was Stephanie who broke her arm, falling off the slide on The Hill. Marissa, however, remembers it differently. Stephanie actually pushed another girl off the slide and she’s the one who broke her arm. I wonder why I remember it differently? But I trust Marissa because she seems to have a better grasp on ‘things that happened at day care’ than me. Anyway, when whoever it was broke their arm, I remember wanting a cast. So I grabbed a plastic shovel, the kind used at the beach and in sandboxes worldwide, and starting hitting my own arm, in the hopes that I could break it without too much pain. It didn’t work. Dr. D: She’s faking. There’s nothing wrong with her. Dr. D: I’m gonna give her a wrist brace. Make her wear it all the time and she’ll get tired of it. And he was right- it was hot and itchy and, surprisingly, I couldn’t move my wrist. I didn’t do anything like that again… though there has been the occasional wrapped foot or knee, because sometimes you just need a little sympathy. Why do I bring this up? Well, one of my students is hobbling around on crutches right now. She has no cast or brace, but is wearing one of those shoes that goes over your cast. She’s walked across my room a couple of times and I’ve seen her walking down the hallway on both feet while some friend or another uses her crutches. It makes me laugh, thinking that her mom and doctor probably had the exact same conversation. I remember a girl coming to daycare in a wheelchair with 2 broken legs and a broken arm. I didn't have a shovel on hand. I used a stick.